﻿ The “Entrepreneurial Leaders Programme” (“ELP”), a unique, one-week intensive and transformative experience for the world’s top Christian marketplace and entrepreneurial leaders. The goal of the ELP is to equip successful Christian marketplace and entrepreneurial leaders to leverage their resources for greater difference-making in their respective spheres of influence such as business, church, non-profits and society. Are you successful in many areas of your life—and yet you have a yearning to expand your difference-making potential, to make your life count, and to build a spiritual legacy? If so, this programme is for you. The ELP is targeted towards owners of for-profit businesses with a minimum of 10 years’ track record of success. It will be a dynamic and interactive environment, with learning from world-class instructors and from a global and diverse cohort of peers. The ELP will integrate guest presenters from Oxford (including Wycliffe Hall) and from around the world. The ELP content is rooted in decades of experience, extensive research and many years of practical application. 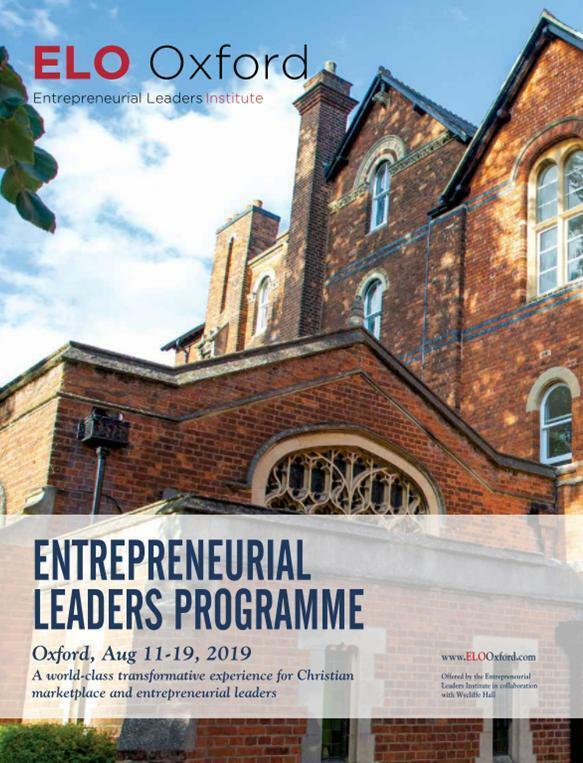 The Entrepreneurial Leaders Institute is offering the ELP in collaboration with Wycliffe Hall, a Permanent Private Hall of the University of Oxford. The Entrepreneurial Leaders Institute is part of Entrepreneurial Leaders Organization (ELO) (www.entrepreneurialleaders.com), which has an unmatched track record of excellence in executive education events. In addition to world-class instruction, the ambiance of Oxford will be inspiring for ELP participants. The 850-year old university city with its fabled spires and medieval colleges, along with various other attractions, is unmatched in the world. The bottom line: there is no equivalent to this high-level Christian leadership education at Oxford to be provided through the ELP. We invite you to join an outstanding group of global difference-makers. For further information and to apply for the Entrepreneurial Leaders Programme, please CLICK HERE to access a “Request for Information.” Once we receive the completed form we will follow up promptly. Thank you for your interest in this programme.